Most of the people I know who track zone entries do so using Controlled Entries, Dump In Entries and “Other” Entries (turnovers etc). I break these down into more specific categories because it better suits my purposes. Much work has been done by many people to show the statistical importance of zone entries in hockey. I’ve included links to some of that work below. 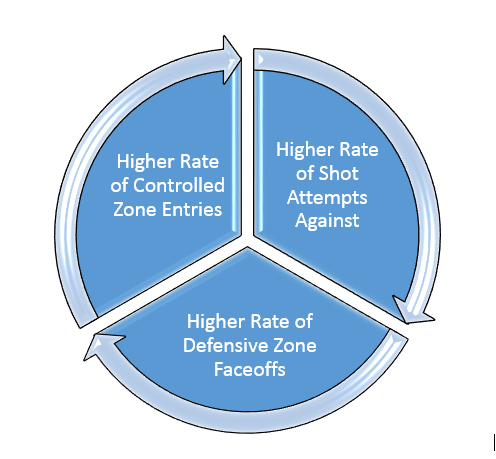 The common belief in hockey at this time is that Controlled zone entries allow the attacking team to create more shot attempts than Uncontrolled zone entries. The underlying principle is very simple. Controlled entries require the attacking team to keep possession of the puck, while Uncontrolled entries require the attacking team to give up possession and then work to get it back. Pretty cut and dry. Recently, Corey Sznajder (@ShutdownLine on Twitter) released the results of a tracking project (All 3 Zones) that entailed tracking every NHL game for a full season (2013-14). The results are available here, for a fee, if you are interested: All 3 Zones Project. As a purchaser of the project results, I am imbued with permission to use them here. 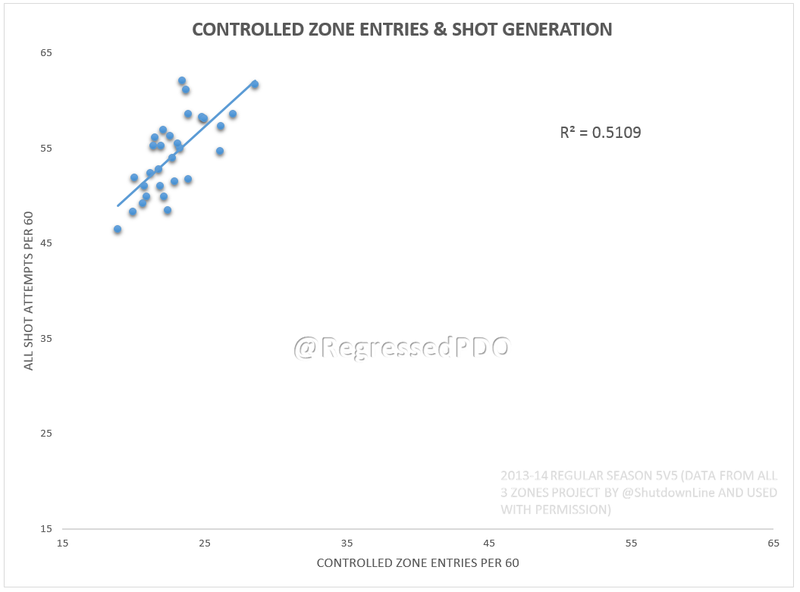 Using the data Mr. Sznajder tracked, we can explore how important Zone Entries are in hockey. All of the graphs and analysis that follow use data collected at 5 on 5 (Even Strength) play with data from http://www.war-on-ice.com supplementing additional statistics. A fit line (blue line through graph) is helpful to show us any linear trend in the data we are analyzing. R2 is a measure of correlation, i.e. how the data fits together. It helps give us an idea of whether the data we are looking at, in this case Uncontrolled Zone Entries Per 60 and All Shot Attempts Per 60, seem to be related. If the number is fairly high, we can then start looking at whether a causal relationship exists (does one thing cause or have some direct effect on the other). 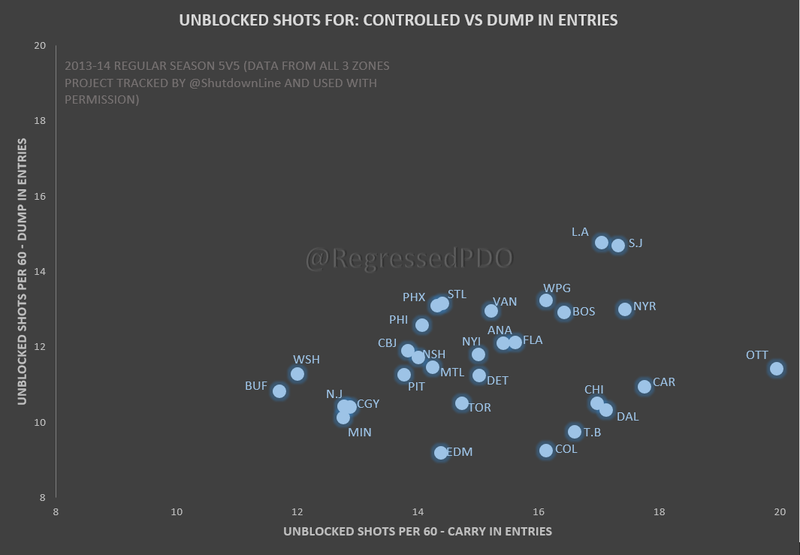 Here, we see that the rate at which teams dumped the puck into the offensive zone didn’t really have much of a connection to the rate at which those teams created shots. “All Shot Attempts” in this situation refers to missed, blocked and on goal shots, commonly referred to as Corsi or SAT. 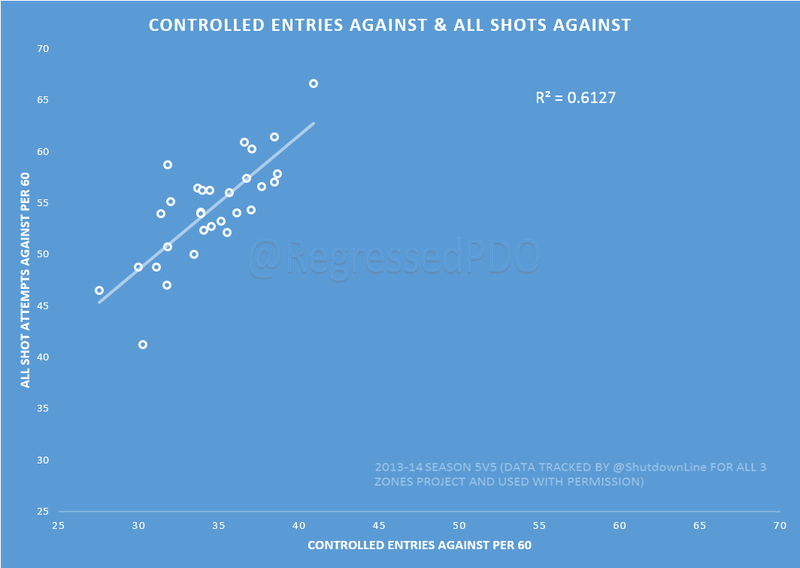 When we compare each team’s Controlled zone entry rate (Controlled Zone Entries Per 60) and All Shot Attempts Per 60 for each team, the correlation percentage comes out to 51.09% which is obviously substantially higher than the 0.75% we saw with Uncontrolled entries. Looking at it from the perspective of how teams created shots helps us find the connection as well. As you can see, while several teams had Unblocked Shots Rates (USAT, Fenwick, Missed and On Goal Shots) above 16.0 at 5v5 off of Controlled zone entries, none of them got that high off of Uncontrolled zone entries. The L.A. Kings had the highest USAT/60 with a mark of 14.77. Sixteen teams eclipsed that rate (14.77) with Controlled entries. What if we look at zone entries from a defensive perspective? Do teams that allow more Controlled entries have higher shot rates against them? When teams allow Uncontrolled entries at a higher rate, we see a slight negative relationship to the rate of shot attempts against the team. When you think about it, it makes sense. When teams dump the puck in, they create less shots, so teams forcing their opponents to dump the puck in as opposed to carrying it in will have lower shots against. The thing to remember here is that teams that allow a higher number of zone entries overall will have higher shot attempt rates against them simply because they are allowing the attacking team to gain the offensive zone. When we compare the rate at which teams allow their opponents to execute a Controlled zone entry with the rate of shot attempts they allow, the correlation skyrockets from 4.48% (Uncontrolled) to 61.27% (Controlled). Essentially what we can deduce from this is that the rate of Controlled entries against a team has a major effect on the rate of shot attempts against that team. Obviously, having more shot attempts increases the likelihood that your team is going to score and conversely, allowing more shot attempts increases the likelihood that your team is going to give up goals. The logical conclusion is that allowing more shot attempts is bad. 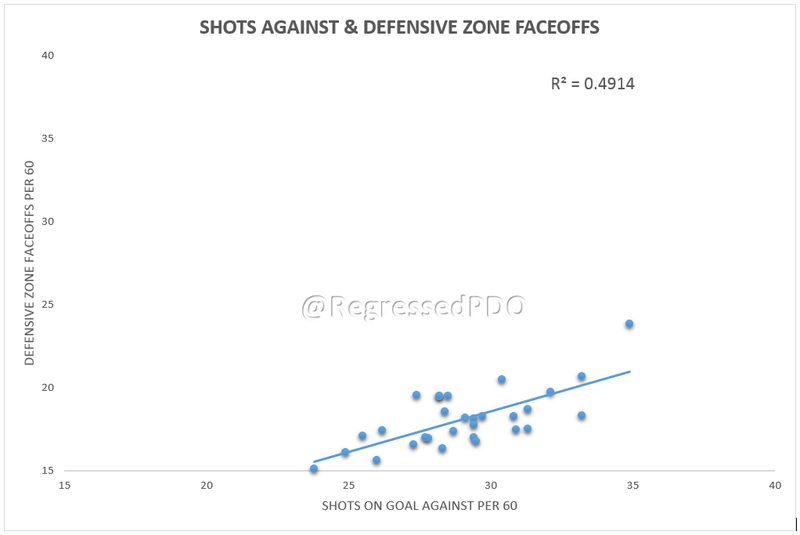 One interesting way to look at this is by using Shots On Goal and Defensive Zone Faceoffs. When a shot is “on goal” the goalie has to make a save. When goalies feel like things are out of control or that the defense is not able to handle the attack, he will often “freeze” the puck resulting in a defensive zone faceoff. As you can see, the higher the SA60 (Shots On Goal Against Per 60), the higher the team’s Defensive Zone Faceoffs Per 60. Why is this a big deal? If we expand our analysis of the rate of defensive zone faceoffs to include Unblocked Shot Attempts (i.e. Fenwick, USAT), we see an even higher correlation of 57.63%. 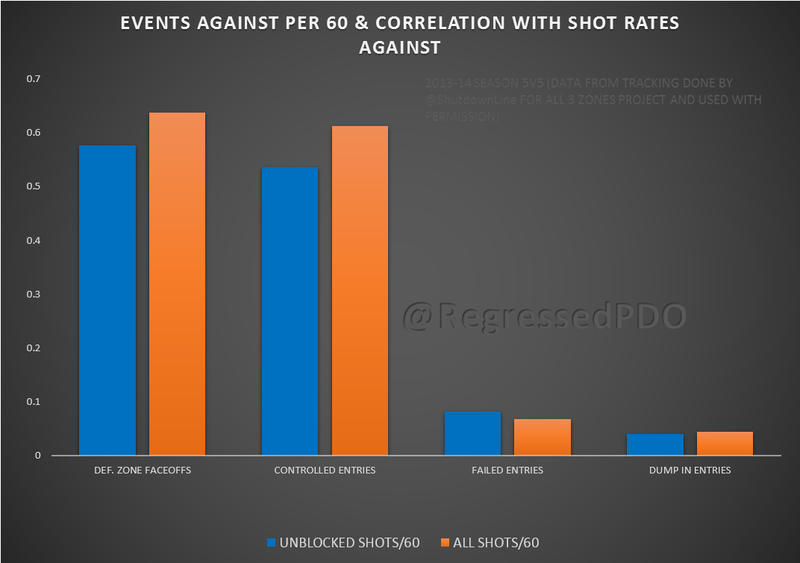 When we compare the correlation of Unblocked Shot Attempts Per 60 with different events throughout the game, we see again why this is so important. Uncontrolled entries have the lowest correlation with shot rates of the events on the graph above, with even the rate at which teams fail at entering the offensive zone having a higher R2. It’s a close call, but Defensive Zone Faceoffs have a higher correlation to Unblocked Shots and All Shots rates than Controlled entries. Considering that a defensive zone faceoff takes place IN THE ZONE where the attack will be launched, it is not surprising to see this. 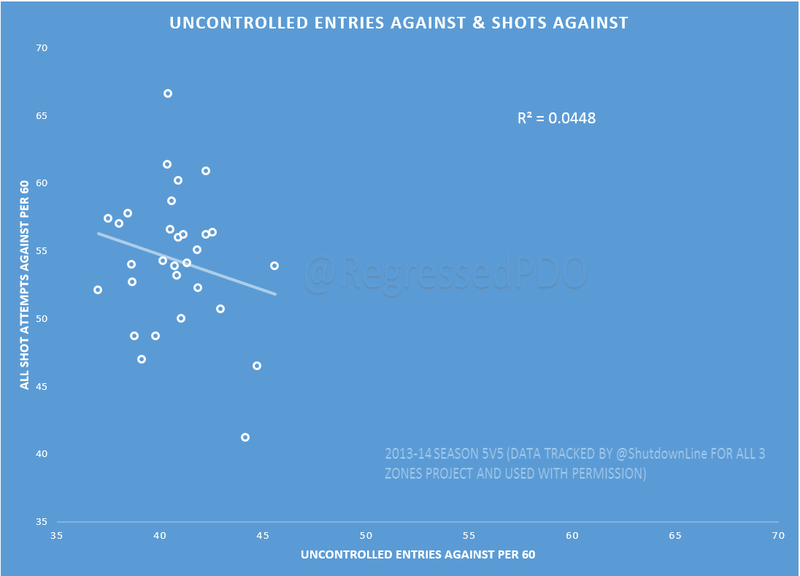 The fact that the difference in the correlation between Defensive Zone Faceoffs and Controlled Zone Entries is only -0.04 (Unblocked Shot Attempts) and -0.0243 (All Shot Attempts) is pretty astounding and again stresses their importance. So, while the TV analysts may preach the values of getting the puck deep, that is not really the best course of action when it comes to generating shot attempts. Certainly, there are times when it is necessary or advisable to dump the puck in, but it should be a last resort option. Controlled zone entries provide far more opportunity to create offense and thus should be the go-to option for an offensive attack.